, but do not worry if you are still working on piecing your blocks. I know I posted at a quick pace in order to have the information available to everyone as needed. I hope you have enjoyed making your blocks, maybe learning something new about design, color, calculating fabric requirements or paper piecing. 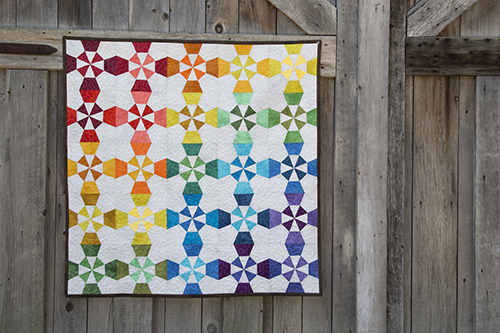 Today we are going to focus on sewing your blocks together to make your quilt top. This is really very simple. I lay my quilt blocks out on the floor or a design wall. (Let's be honest, usually the floor.) I start at the top and sew the blocks together row by row. The most important thing for me involves pressing the seams. I like to press my seams in alternating directions per row. For example, I will press all my seams in the first row to the right. Then I will press all my seams in the second row to the left. Then continue, right - left - right - left. These alternating pressed seams become "locked" together when you sew your rows to each other, forming the finished quilt top. And that's it! Finish your quilt as usual. I'd love to see pictures of your completed Lighthouse Quilts (or quilt tops), so feel free to post links in the comments as you finish your projects!